Adult Egyptian Geese are 24 to 28 inches long and weigh about 4½ pounds. The sexes are similar, the head and neck being a pale gray with the sides and crown a mottled brown. A dark yellowish-red band occurs behind the neck. A chestnut ring runs around the lower neck with a similar patch around the eye and a line from the corner of the eye to the base of the bill. The mantle and upper parts are a reddish-orange with fine black vermiculations (ornamental patterns like worm tracks). The lower breast has a patch of deep chestnut resembling an inverted horseshoe. Dusky brown scapulars have fine whitish speckles. The rump and tail are black-brown. The bill is pink with a black tip and the legs are pink. Immatures are duller than adults and lack chestnut on the face, neck, and breast. 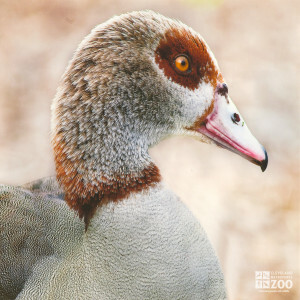 The range of the Egyptian Goose is Africa and the eastern Mediterranean area. The habitats of Egyptian Geese includes tropical to sub-tropical marshes, ponds, lakes and river banks. The Egyptian Goose is a large shelduck. These birds are usually found in pairs, but large flocks occur in wheat-growing regions. They are considered a pest by South African grain farmers because they eat and trample shoots. They are daytime feeders and roost at night in trees and on sandbanks. This is a noisy and violent bird — pairs often fight. Although well able to swim and dive, this species is often seen grazing on open plains, especially after rains. Nests of Egyptian Geese are in holes in trees or on the ground, lined with down. Nests are well spread out and defended vigorously. Only the female incubates but both parents raise the chicks. The young get adult plumage in 3 to 4 months but take 2 to 3 years to mature.